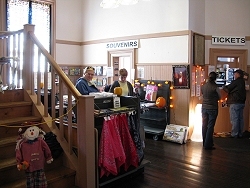 In August of 2008, we visited the Little River Railroad and Lumber Company museum in Townsend Tennessee. Later, while I was doing further research for an article about the railroad and the museum, I discovered that one of the Little River RR's unique locomotives is still operating, in Coldwater, Michigan, about 550 miles away from its one-time home. 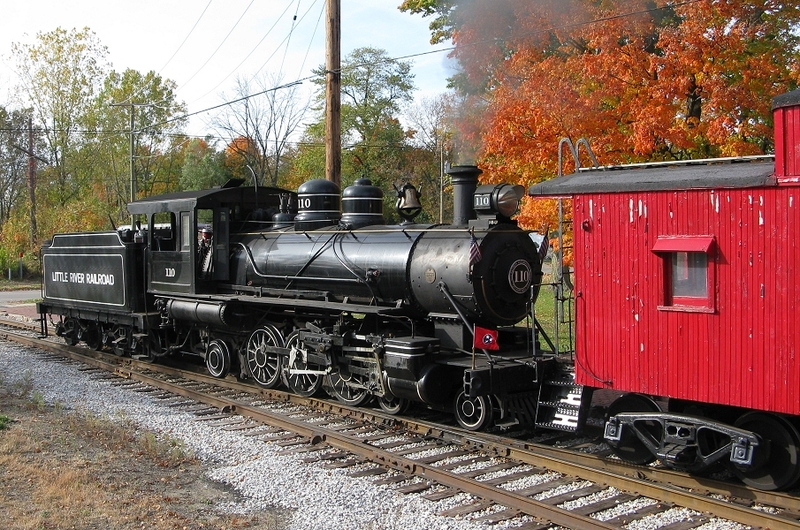 In October, 2008, I drove to Michigan, picked up my father in Grosse Ile (near Detroit), traveled around the state some, then drove to Coldwater (south central Michigan) to see one of the most unique operating steam engines in the world - a standard-gauge Pacific (passenger engine) that is smaller than many "yard goats" (local switch engines). 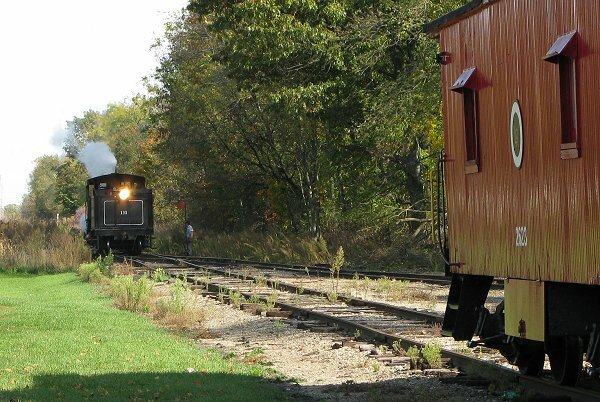 We discovered that Michigan's edition of the "Little River Railroad" has many nice additional features, and has been able to preserve several unique railroad cars as well. 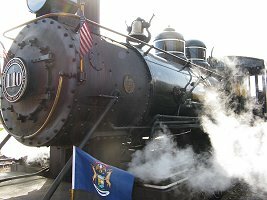 Michigan's "Little River Railroad" takes its inspiration from its best exhibit, a unique locomotive with a unique history to match. 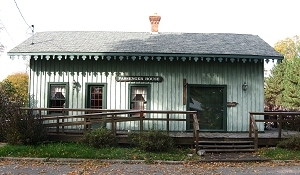 If you've read our article on the Unique Features of the Little River Railroad, you'll recall that Col. Townsend built his logging railroad to standard gauge (56.5" between the rails) instead of narrow gauge (36" or less between the wheels). This way his lumber cars could run on the railroads he linked up to, and their passenger cars could run on his. But he laid the track of his railroad the way most companies laid the track for narrow-gauge logging railroads, using lightweight rails and the bare minimum of grading and support. As a result, even the smallest and most sure-footed locomotives strugged to stay on the track. 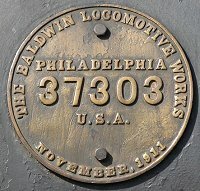 After a series of experiments, Townsend asked Baldwin Locomotive works to design a passenger-type engine that would run on his trackage. 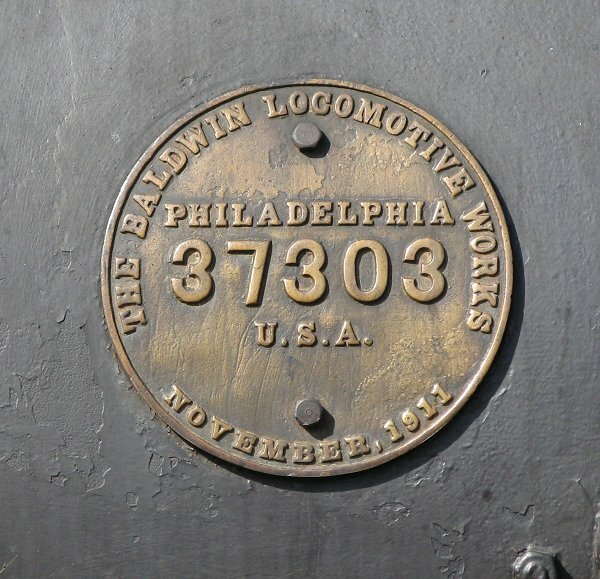 In 1911 Baldwin produced one of their most unique locomotives. 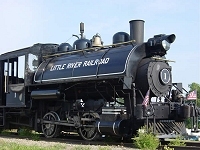 As a Pacific type (4-6-2), number 110 had four pilot wheels, six drivers, and two trailing wheels, but it was the smallest Pacific-type locomotive ever built for standard gauge. 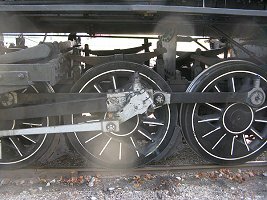 How do you design a 4-6-2 that will stay on some of the worlds' roughest standard-gauge trackage? 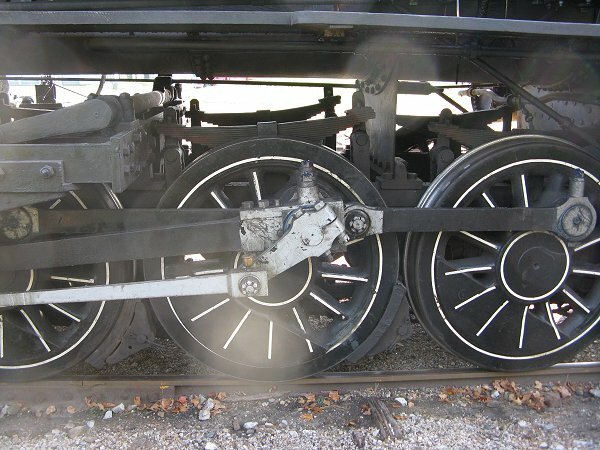 As part of the solution, 110's drivers are only about 47" in diameter, quite small compared to the drivers on most contemporary Pacifics, which ranged from 68" - 80". If it helps to think of it this way, 110's fixed wheelbase (the distance between the axles of her outside drivers) is about the same as the wheelbase of a Dodge Neon. And this was made even more flexible by leaving the flanges off of the center pair of drivers, a trick toy train manufacturers use so their trains will run on ridiculously tight curves. According to Terry Bloom, the center drivers are a little deeper than the others so that they don't wander completely off of the railhead on tight curves. 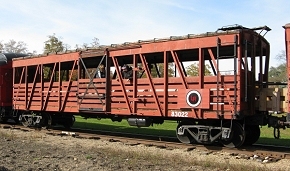 Number 110 was the "pride and joy" of the railroad for some twenty years, but as the Little River Lumber Company wound down its operations in the late 1930s, number 110 started being used for logging service. Fortunately, she was saved from being scrapped like several of her sister locomotives when the railroad finally closed down for good. For a time, 110 ran on the Smoky Mountain Railroad, a "common carrier" in the Smokies. In 1966 she was abandoned at Shook's Gap. One version of the story is that she had crossed a trestle that they didn't think was safe for her to cross back over, so she was "trapped." 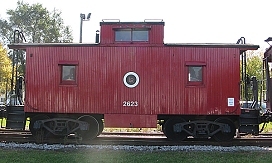 In 1972, Terry Bloom, of northeastern Indiana, rescued her and had her hauled to Brookville, Ohio to be rebuilt. In 1975, she traveled "on her own wheels" to Angola, Indiana, and has been running ever since. 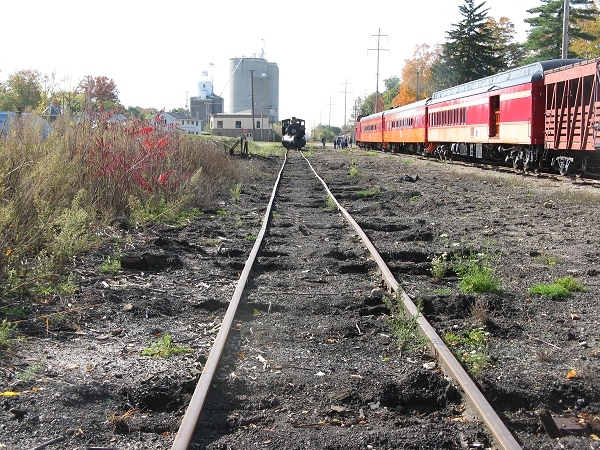 She is now running out of the depot at Coldwater Michigan, making a 15-mile trip to Quincy twice most weekends. Terry likes to point out that 110 has been running longer for him than she ran for either of her previous owners. I also asked Terry if the gift shop had any books about number 110 or the development of Michigan's "Little River Railroad," but he said there weren't any yet. I told him I knew a good writer. . . . 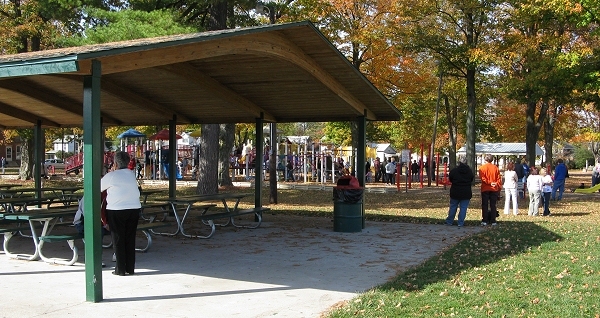 When we reached Quincy, we stopped at a city park with a nice shelter house and lots of jungle gyms, slides, etc., for children to play on. I understand that in some of the "special" trips, there are picnics or other activities here. 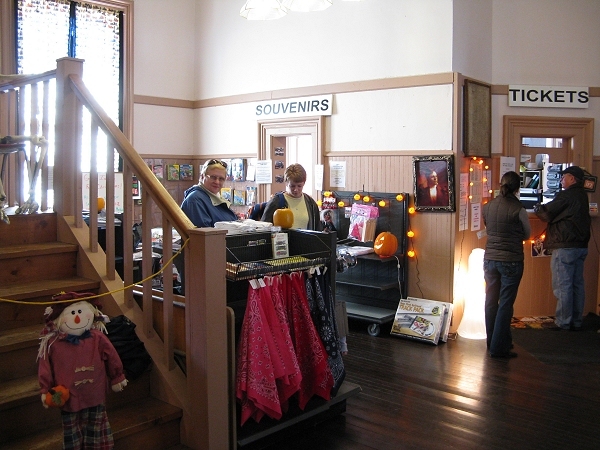 The day we rode, a family was selling pumpkins and squash from a pickup bed and a folding table. 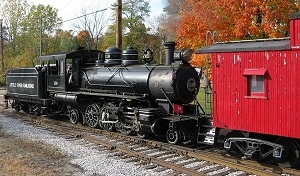 110 was uncoupled from the train, and Terry pulled her forward past a turnout (switch). A young fellow whose name I didn't catch threw the turnout, and Terry backed 110 onto a parallel track. Of course each change of direction was accompanied by some very artistic whistle-blowing, reminiscent of the best D&RGW recordings. Terry backed #110 past the train and over a quarter of a mile beyond, where he reached another turnout. While I watched him, I took a look at the passing track and its roadbed. It looks like many of the ties have completely deteriorated and that someone has dug out every few ties and put a "good" tie in, to keep the track in gauge and reasonably level. Later I saw that some of the "mainline's" trackage had been repaired the same way. Terry tells me that "The track is maintained and used by the Indiana Northeastern Railroad. We only lease the track from them. It is maintained to FRA Class I standards which makes it good for 15 miles per hour." Eventually #110 passed the next turnout, and, with the help of the ground crew, pulled back onto onto the "mainline" behind the train. Terry came back within a few yards, then slowed drastically as a worker helped him bring the locomotive's coupler up to the coupler of the caboose he woud now be pulling. After a series of hand signals, Terry stopped, and the worker threw the mechanisms to close both couplers. Then, at another signal. Terry moved forward a few inches to make certain the couplers were linked. 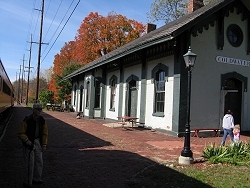 After a few more moments for photos, we reboarded and made the return trip to Coldwater. 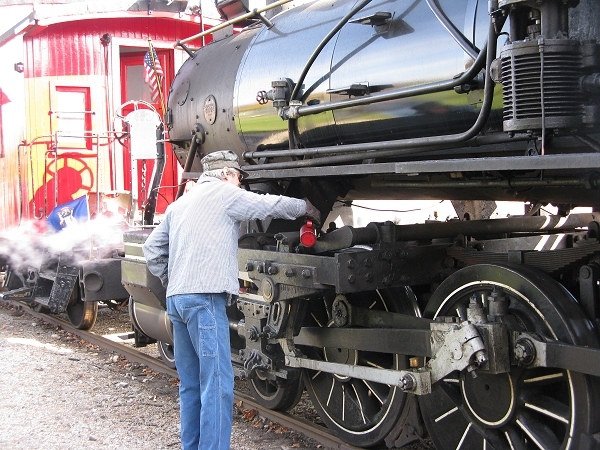 Back at Coldwater, the crew topped off #110's tank, and Terry allowed the locomotive to cool somewhat. 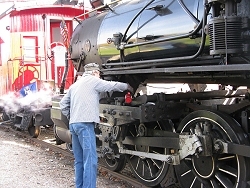 Workers also relubricated a couple dozen points on the locomotive's rods and valve gear. I'm glad I don't have to relube my car after every thirty miles. . .
Locomotive #1 - #1 is an 0-4-0T locomotive, which means it has no pilot or trailing wheels and it carries its water in a tank on top of the boiler, instead of in a trailing car. This was a good acquisition for the LRRR, because it gives them a backup on the few days when #110 is out of service. However #1's "pedigree" isn't quite as clear as #110's - it contains parts from at least two different locomotives, the oldest parts dating back to 1908. #1 wasn't on display the day we were there - I borrowed the thumbnail above from the LRRR's web site. Still if you get a chance to see it, #1 is a great example of a typical switching locomotive used by many industries between 1900 and 1960. 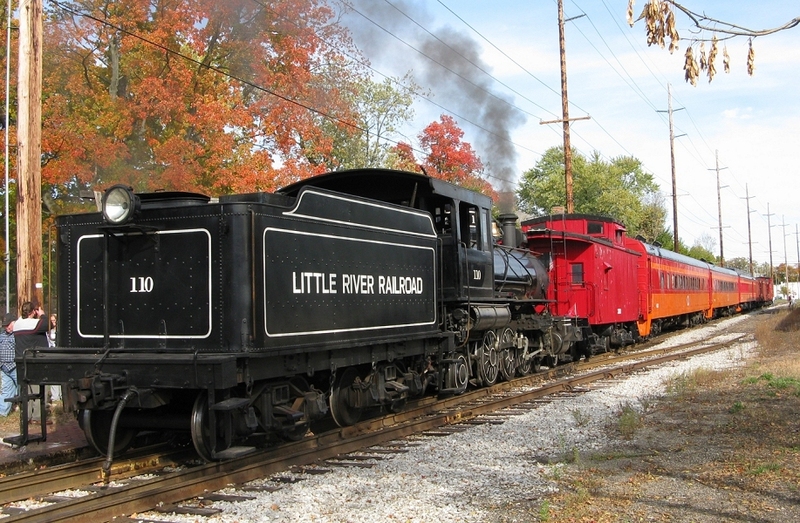 (Click here to see a photo of #1 on the Little River Railroad's Web Site. The Cabeese are from B&O, built between 1924 and 1929. They really are the same color and have the same number of windows - I took the photo on the left from the shady side of the train, and I took the photo on the right from the sunny side of the train. 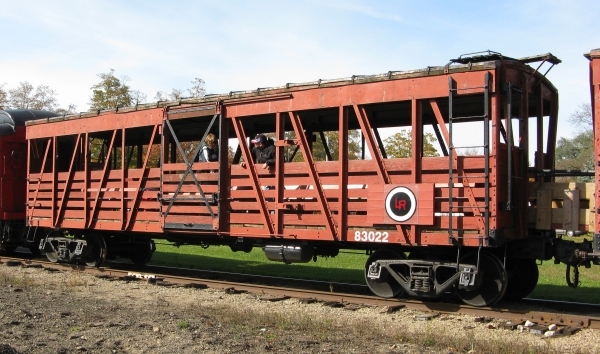 The "open air" cars were built as stock cars in 1933 for the Northern Pacific railroad. They have steel side-frames and wooden slats. Little River Railroad's web site and printed materials mention that the top several rows of boards have been removed so passengers can easily see out. What they don't mention is that all of the floorboards have been replaced with fresh lumber, a wise and sanitary move, in my opinion. 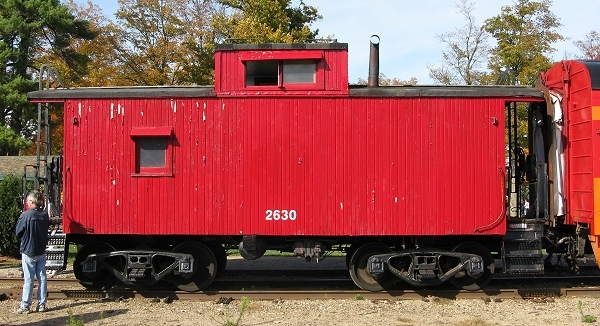 The Heavyweight we rode in was a combine (half baggage-car) built for the Chicago and Alton railroad in 1925. 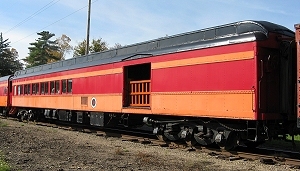 It has been repainted to match the "Milwaukee"-colored coaches. 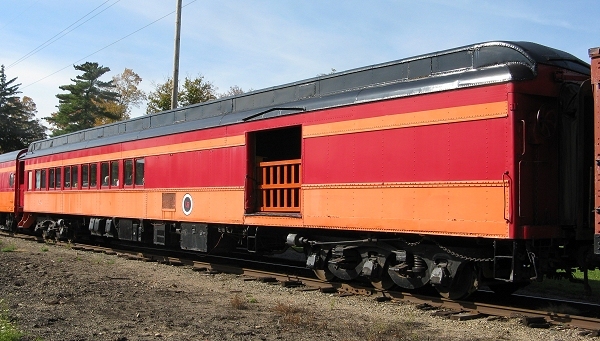 The Milwaukee Road streamliners are "parlor long distance cars," built in 1947 and 1947. According to the LRRR's printed materials, they were built for high speeds and long distances, and they have "modern" restrooms in both ends. 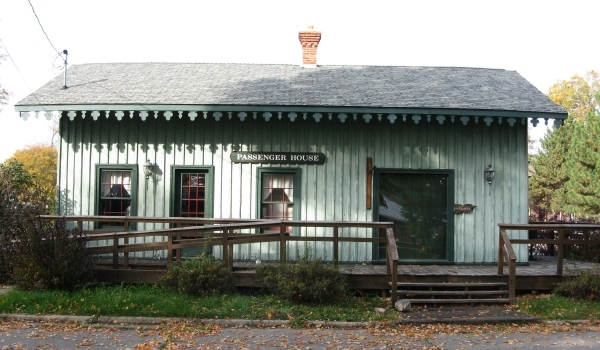 A vintage-looking board-and-batten building labeled "Passenger House" stood nearby, but it was not open when we were visiting. For me, the trip to see #110 was the culmination of a three-month project to document one of the most unusual North American railroads ever - a logging road with common carrier aspects and a willingness to experiment. We did combine this stop with other stops, so in a sense our visit only added 80 miles to a trip that was already almost 800 miles long. Was it worth 80 miles? Yes, if nothing else, the pictures were worth the trip. (Click on the title photo to see the blow-up if you're not convincedl) Would it have been worth 800 miles? Probably not. 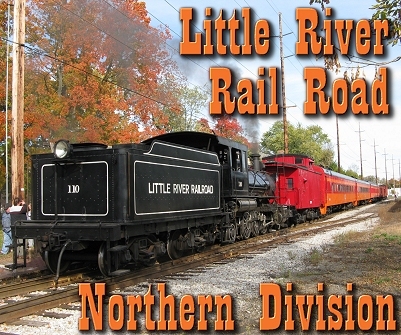 However, the LRRR (Northern Division) does have several longer, unique runs a year that provide many unusual photo opportunities. Check their schedule page once you click on their link below. Better yet, if you could combine a ride on the LRRR with, say, a ride behind a Pere Marquette Berkshire at Owosso, Michigan, that would give you a sampling of the most powerful and the most compact road locomotives. To me, that would be the makings of a great vacation! 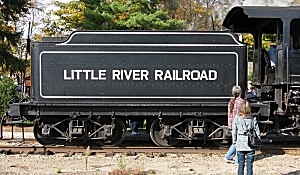 For more information on the Little River Railroad that operates at Coldwater, Michigan, visit the Little River Railroad's Web Site. Note: Family Garden Trains™, Garden Train Store™, Big Christmas Trains™, BIG Indoor Trains™, and BIG Train Store™ are trademarks of Breakthrough Communications (www.btcomm.com). All information, data, text, and illustrations on this web site are Copyright (c) 1999, 2000, 2001, 2002, 2003, 2004, 2005, 2006, 2007, 2008, 2009, 2010, 2011, 2012, 2013 by Paul D. Race. Reuse or republication without prior written permission is specifically forbidden.